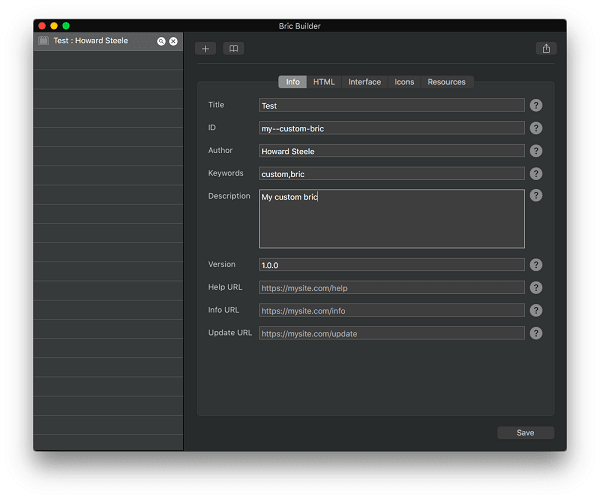 Blocs is a software used to create websites in Mac OC (10.10 Yosemite and higher). This is a unique niche product, the major goal of which is to provide Mac users with a premium web building tool. There is no separate product version for Windows. The target audience is Mac users only. Blocs is a downloadable software used to create promo websites, landing pages and portfolios. Apple ideology is in the basis of the product: according to the major idea, a user has to get aesthetic pleasure from working with the application. Quality and extensive functionality of the program contributes to this objective. When it comes to Blocs positionaing, user impressions and experience come first. The majority of users understand that if web designers have notably invested into the development of interface design, then the rest of the features will be also provided on a decent level. Can this statement be applied to Blocs? That’s not quite clear yet. So, let’s make the detailed analysis now to find that out. 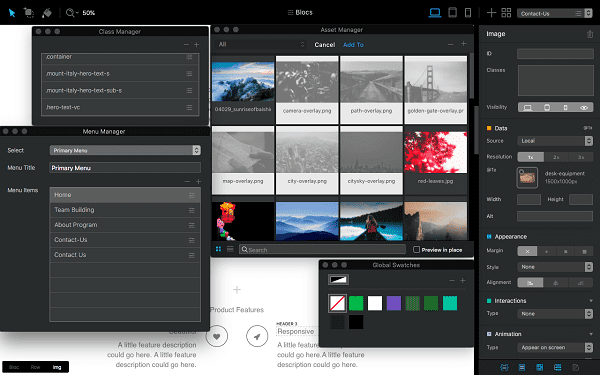 Blocs is the application, which encompasses the features of the WYSIWYG web page editor, a set of readymade blocks to fill a website, brics (the analogue of widgets in similar systems) and design customization settings of each website element. Just like any other Mac OS application, Blocs has a standard dashboard with settings, which includes File, Edit, Page, View, Help etc. Everything is logically-structured and commonly organized here. The interface is intuitive yet complex. It resembles lots of other editors of cloud website builders and Adobe Muse in its designs and customization settings, but it doesn’t copy them in details. It is easy to work with the interface and it will take from 1 hour and up to 1-2 days to get used to it depending upon your experience of working with other website builders. Detailed exploration of features and realization of Blocs options will take around 1-2 weeks. This time will be enough not only to memorize the elements and their positions, but also to learn the basics of correct program use, if you have enough practice. In this case, it won’t be a serious problem for you to learn the combinability of template design elements and the aspects of appealing content presentation made with their help. When making new actions, you will be offered pop up tips. Learn them to speed up the progress and understand the unevident nuances of working with Blocs. When it comes to the use of the app, it seems to be convenient, quality and full of original structural options. However, the system uses the same means and web building approaches as the majority of WYSIWYG services. 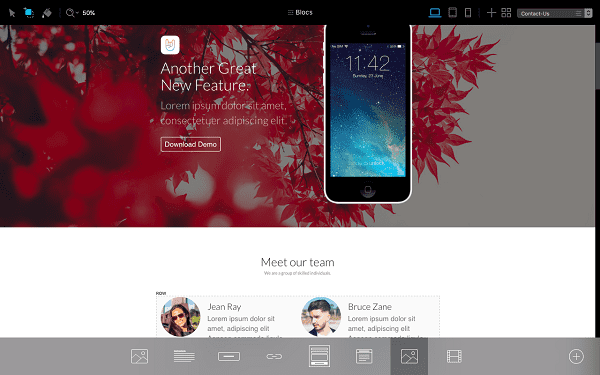 Blocs allows designing web pages without any coding, but by means of using drag-and-drop functionality. Each web page contains three sections, namely the upper Global and Dynamic sections and the lower Global section. The essence is the following: the elements you will add to the Global section will be displayed on each page. These are generally menu, header and footer. The unique element of each web page should be created in the “Dynamic” section. You can create the unlimited number of web pages (by activating the “+” button in the right upper corner), which will be provided in the Primary menu by default. The full list of created web pages is displayed in the same corner. By choosing any of them, you can access SEO settings, display settings, language selection and code adding options etc. Next to it, there are elements used to change the preview mode – from the desktop to the mobile and back. Blocs offers 2 types of web design options: readymade blocks and brics. The editor provides multiple categories of readymade blocks, which can be added to any web page as blank canvases or those with demo content. Their list is as follows: structure, hero, navigation, headers, carousels, articles, devices, features, team, gallery, call to, pricing, social, testimonial, brands, special, footers. To add a new block, you have to click the “+” button found between the neighboring blocks. A set of template blocks is more than enough to completely form portfolio, landing website or promo website pages in less than 30 minutes. Then you’ll be able to add your own materials – photos, videos, texts, titles, icons, colours, effects etc. to give your project unique look. Brics are the elements the blocks consist of. They can be added separately. You can use a blank template, design the block layout manually and add suitable brics to any of them. To get access to the brics, you should activate the “D” button, while to preview the complete list of elements the “O” button should be activated. Not more than 8 brics may be found on the quick access control panel at a time. This set can be modified, although, such approach is inconvenient. You’ll have to access the full list of elements, which is provided as a separate appealing screen. It looks effective and feels nice, but this slows down the working process on practice. All in all, 50 brics are available here. Let’s enlist some of them: headings H1-H6, paragraph, backquote, image, video, carousel, button, dropdown, form, text (link, field, area), checkbox, radio, columns, label, container, list, divider, etc. By combining these elements, you can create blocks with custom functionality. To add brics to the web page, you should select the one you need and click the area it should be added to. Then you proceed to the next element etc. 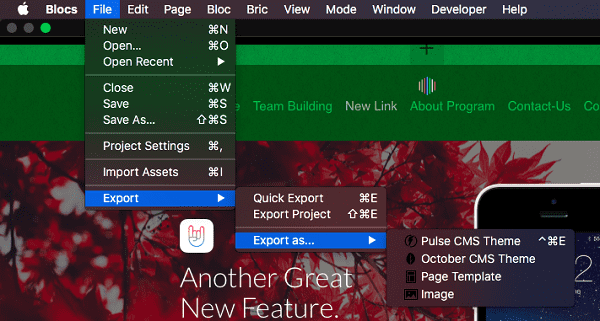 When choosing any of the blocks or brics, their actual settings will be displayed in the right part of the sidebar. The set of parameters differs with regard to the selected element. For example, you can choose the font type, style, animation and display parameters for a text. Screen resolution, height/width, appearance (space, style, alignment) and animation can be selected for images. ID/Class can be assigned to each element. Notes, which provides the notes on the current project. Upload Mode used to work with a colour palette and web page painting. There is one more settings menu with a non-standard positioning – the Project Settings. It is opened in the upper central part after clicking the “Blocs” section. By using it, you can set up your website width, web address, favicon, logo, scripts, preloader and add Google tracking code. You can also choose the CMS you’d like to optimize the new website code for. 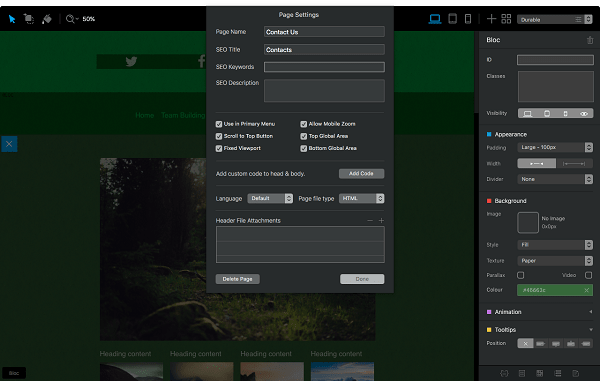 Yes, websites created with Blocs, can be used as templates for several CMS, including Pulse, Surreal, October and Cushy. October CMS is an OpenSource project, while the other three systems are paid. Their cost constitutes from $3000 and more. 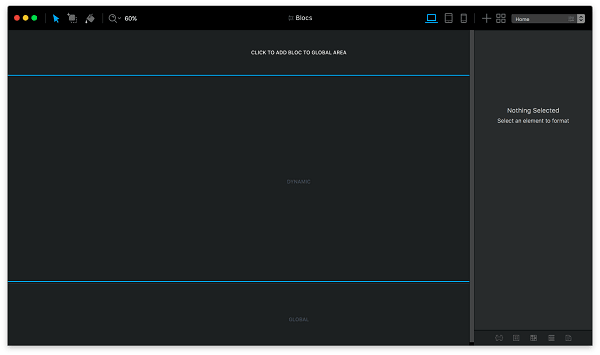 By the way, Blocs editor supports standard OX button combinations – copy, crop, insert, cancel etc. Apart from that, you can create your own widgets in the Brics Builder (they are available in the “Developer” section), but coding skills are needed to do that. As far as Blocs is not a cloud website builder, but a desktop application, all the websites created with it require hosting. You can save a project on HDD in the .bloc format to be able to work with it further or as a website file array to be uploaded to the hosting of your choice. It’s also possible to save a project in the template format for the above mentioned CMS. Unfortunately, Blocs doesn’t have an integrated FTP manager and, thus, you will need to use an external application to upload your website to the hosting or update its files, when required. This is very inconvenient, especially if you frequently need to update a website. You will eventually get a simple HTML website structure, which doesn’t have a cloud dashboard for content editing. That’s why, its use in combination with CMS is a more beneficial solution. You can easily update your website, but here emerges another problem – the necessity to master CMS, where the template created with the app will be installed. This is quite a complicated scheme. 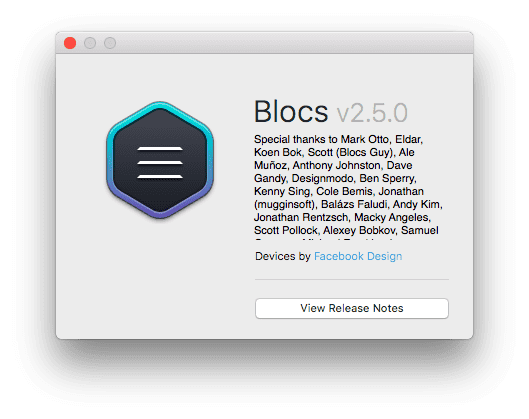 Generally, Blocs functionality is on the decent medium level. Its major advantages are interesting design and original presentation of standard features. They are enough to design appealing business websites, even those that don’t accept online payments. The app requires hosting and sometimes CMS that will be compatible with it. Blocs itself is not an individual working unit. Basically, Blocks is the app used to create HTML web page templates. All the themes built for this system are based on the use of stock editor tools. Generally, the major essence of a program user is to learn to create appealing web pages independently. A template is a project image with .bloc extension, in which the blocks are designed successfully. There are no ready made default templates after Blocs installation and launch. You face the necessity to start a new project and draw your web page structure yourself. If this variant doesn’t suit you for some reason, you can choose a template at the official website. The cost of one theme constitutes $20. As of today, there are 24 designs available there. You can have a look at the ready made Blocs samples. You can also register a subscription for $89 and get access to all these designs for 1 year. Lifetime access to this collection will cost you $149. These are one-time payments without any subscription. You can create your own websites on the basis of the ready made designs by customizing their content. This variant, probably, works best for newbies. If you have desire and skills, go ahead to create the unlimited number of your own templates, saving them as projects on the hard disk. To design client websites, you can use your samples as many times as needed. If you need 1 website for personal use, the best decision will be to create its pages from the ready made blocks. Access to CSS styles will make it possible for experienced users to create custom elements. There are also animations, which are available to everyone. They can be flexibly set up and look appealing. By matching the combinations of brics, colours and fonts, you will be able to gradually learn how to create impressive web page templates (by the way, you can save them separately, without saving the entire website). This is how you will eventually get a collection of themes for various types of websites and separate pages. Mind that all the Blocs themes can be edited only in this program or by means of editing the codes of projects saved on the hard disk via external editors, which is quite inconvenient. It’s worth mentioning that the application allows creating very appealing websites granted that you have decent web design skills. Blocs provides users with a sufficient number of customer support options, including forum, Vimeo channel and Knowledge Center. All of them feature decent quality, especially FAQ and video tutorials. You can contact the developers via the online support desk, while the recent news are available in the official blog or Twitter channel. All the tutorials allow using the search filter option. They are detailed and structured into categories. The quality of tech support is ok. To get in touch with it, you should be a registered Blocs user. By the way, there is no live chat and email communication option here. There is only the ticket system you can make use of. 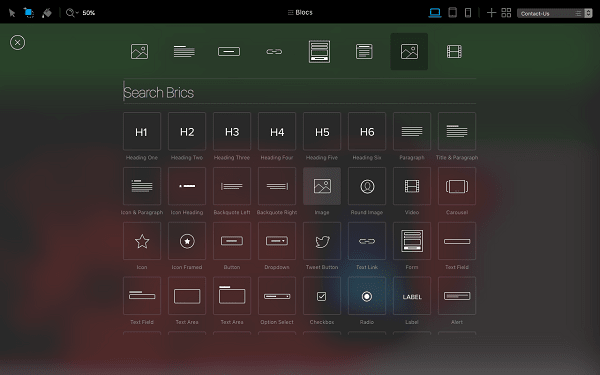 You can download the trial version of Blocs for free from the official website. There are 2 types of the paid license, namely Personal ($80) and Team ($360). The first one can be used on 2 various Mac, while the second can be used on 10 computers. Such subdivision signifies that the developers present the app as a tool to create client websites. There is no big difference between the personal and team license versions. The cost of Blocs website publication is not limited to the cost of license only. You will also need hosting, which will cost you around $100 per year. Apart from that, you’ll have to pay $60, if you have the desire to update the old version of the app to the new one. In other words, you purchase the license for the current program version only. We have used Blocs 2.5 to test the service. If you plan to create websites with the online dashboard, then the cost of using the Blocs app will notably increase because of the necessity to buy CMS. This will approximately constitute $300. You may also have the desire to use an appealing ready made template from the brand collection. In this case, you should add $89 more to the general cost. Considering all the nuances, the conclusion is as follows: Blocs websites are comparatively expensive. Almost complete inefficacy of using the program without CMS. Simplicity of use is also questionable as there are no ready made templates provided by default. You have to purchase them or create on your own. Regardless of the technical simplicity of the editor, many newbies won’t be able to launch an appealing website with individual design here. Skills are required to do that. That’s why, the use of Blocs will trigger extra financial investments into templates and CMS. Blocs is a decent niche product. It works well for launching business websites with a small number of pages, such as promo websites, portfolios and landing pages. If you approach the web development process wisely, the websites will be appealing and functional. Regardless of the pleasant interface and general positive impressions from the working process, this application is not the best choice for an average user. 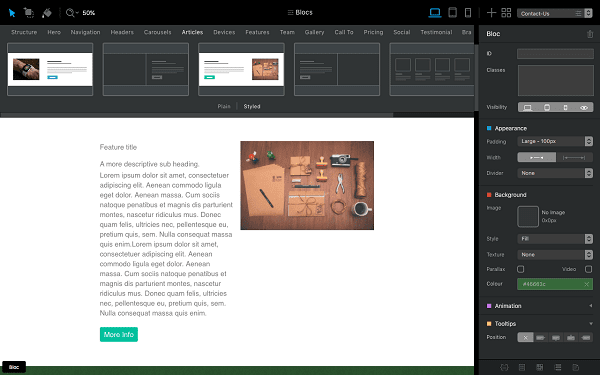 Blocs can be considered a stylish HTML web page editor, which requires extra tools to publish a website. It is inconvenient to use it independently. When working with CMS, the situation changes for the better, even though, it’s not possible to call this scheme convenient and cheap. You will have to master the FTP manager, hosting set up and CMS itself. This is quite overwhelming for a person willing to create the first website, isn’t it? Here arises the question: why use Blocs, if this is so complicated? Maybe, it makes sense to choose a more suitable website builder and stop making simple things difficult? Anyway, it is much simpler and more affordable to use a quality cloud website builder with a WYSIWYG editor. You will get hosting, templates, bonuses (like a free domain name or something like that) and, what really matters, a single interface for the entire web building process. It’s also more convenient to make the payments here – everything is found in the same interface. Just like any other desktop web building application, Blocs cannot compete with renowned cloud website builders. It is not about the quality of the product. It’s about its type: the app requires more technical skills to be used to the advantage as compared to website builders and it also ensures similar result. So, why make things complicated? Unfortunately, Blocs is initially a lost case for the prevailing amount of users.